In 1841 building work started on the landmark Town Hall in Oldham, the North-Western town which through its heyday was a centre for the cotton-spinning industry. This neo-classical edifice with an imposing columned façade provided accommodation for civic and administrative uses and for police and court functions and included a ballroom. There were many elaborate ornate plaster features to ceilings and walls. The internal architecture, however, was less successful than its imposing exterior: the layout was complex, circulation routes were poor and there were many changes of level. 175 years later the Grade-II- listed Town Hall – like the civic community, which by then had been described as the most deprived borough in England – was sadly diminished in stature. The building was placed on the ‘at risk’ register. Various attempts at conversion failed because of the complexity of the building and the scale of the renovation works required. What turned out to be a remarkably successful public-private partnership led to an inspirational three-year project that transformed the building into a vibrant focal point for the community, symbolic of the Council’s intention to lead the regeneration of the wider city centre. The vision was to restore the grandeur of the original building but to add a truly-innovative and visually dramatic ‘light-box extension’ some 88metres long and 11 metres high with 257 illuminated panels that would mark the building’s renaissance by day and by night. 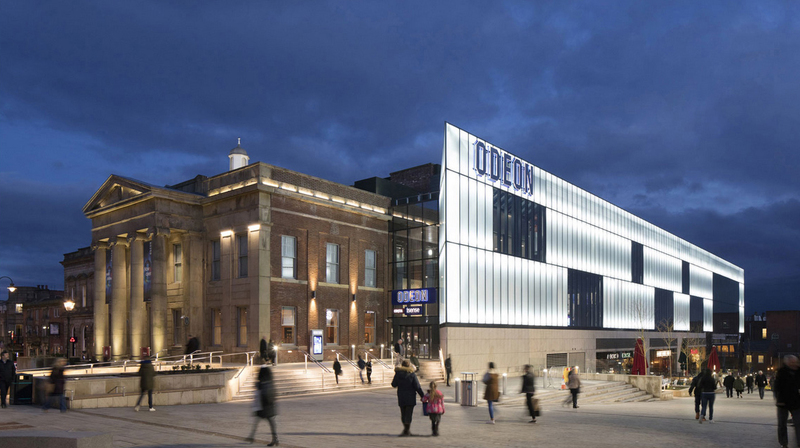 The new Town Hall complex would include seven cinema screens for the Odeon’s new home in Oldham, family restaurants and links to new retail outlets. The eventual cost of the three-year project was in the region of £37 million. Ornate Interiors were commissioned to apply their unparalleled expertise in the restoration of heritage buildings to a wide range of technical problems in over twenty rooms and in the sweeping staircase areas. The contract value was approximately £600,000. Lime plastering was applied to masonry walls and lath and lime plaster to ceilings. Many existing in-situ mouldings were beyond repair so mouldings had to be cast to replicate the originals. Features dealt with included cornices, ornamental fluted corbels, beam casings, Ionic column capitals, ceiling roses and roundels. Lighting trough cornices were created for the staircase. In the Egyptian Room loose sections of the ceiling were removed and reinstated in lime plaster. 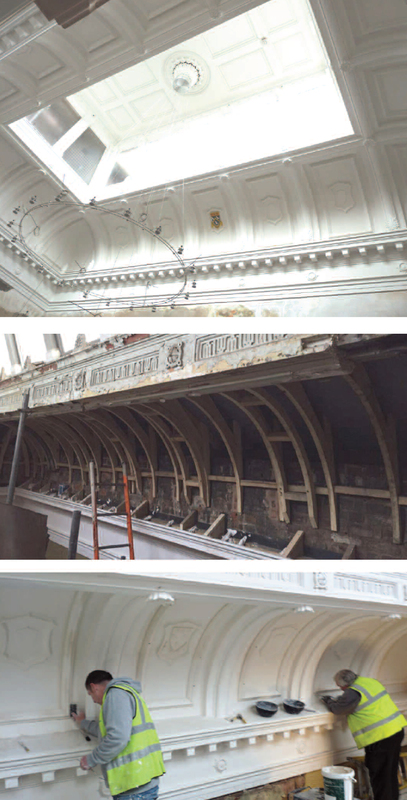 Damaged sections of cornice were removed and matching replacements were manufactured in fibrous plaster and reinstated. 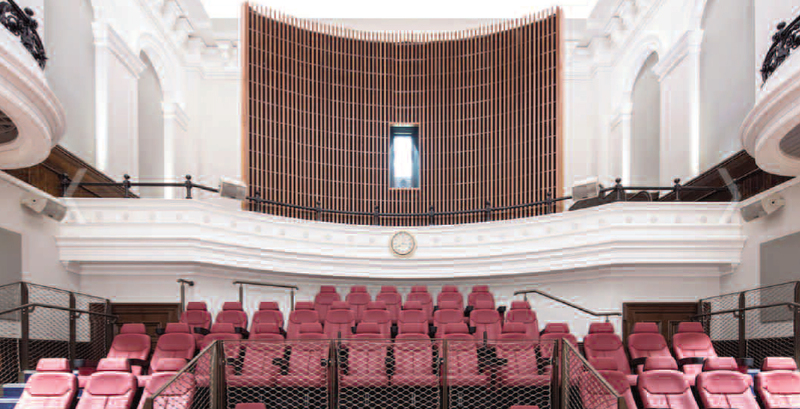 The chief challenge was the reproduction and installation of fibrous plaster corbels for the courtroom which had been chosen for one of the new cinema spaces. The existing corbels were solid casts which could not be installed onto the new acoustic-rated ceiling, and were too heavy to be installed only onto the walls. New fibrous plaster corbels were therefore made, together with pre-manufactured back plates to enable the corbels to be fixed onto the walls and not the ceiling. Ornate interiors are rightly very proud of their contribution to a project that was judged the winner in two out of eight categories in the 2017 RICS Awards for the North West for which 37 different projects were shortlisted. The Oldham Town Hall project was judged first for Design through Innovation, and for Regeneration. It was also deemed overall winning Project of the Year – a huge achievement.